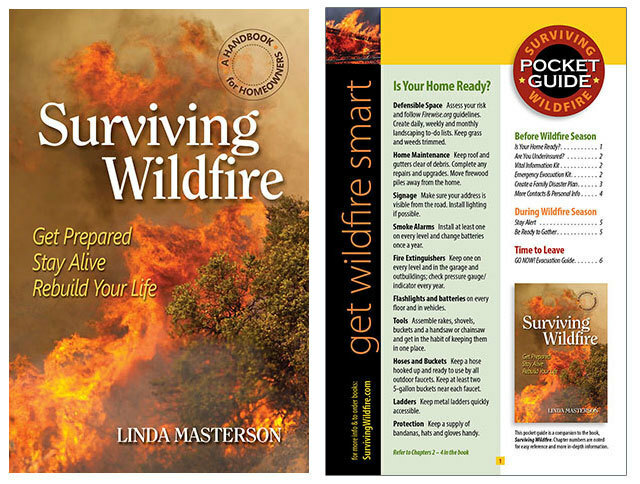 Wildfire Ready Combo Set includes the Surviving Wildfire book and companion Pocket Guide. Author and researcher Linda Masterson knows what it’s like to flee a wall of flames in the middle of night, with just minutes to escape with her life and very little else. Her home in northern Colorado burned to the ground in the Crystal Fire in 2011. Now she’s sifted through information, resources and expert advice from across the country to put together a practical handbook and personal pocket guide for homeowners who want to be better prepared if disaster strikes.